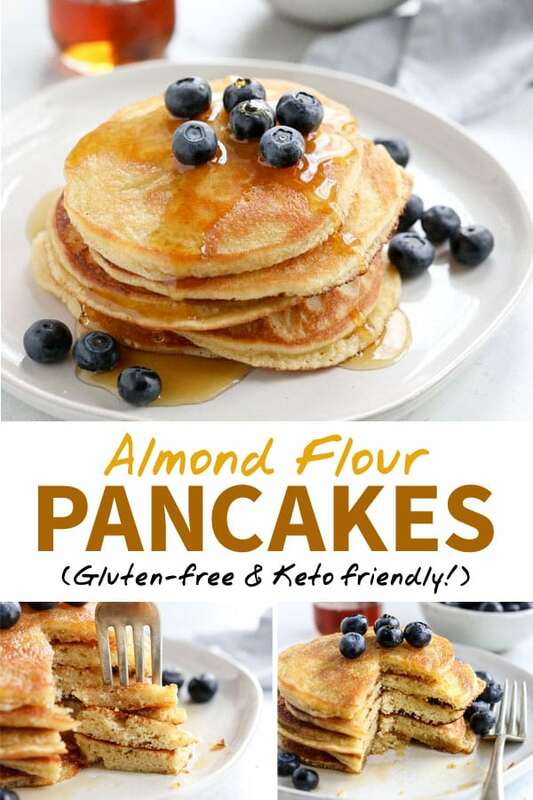 These Almond Flour Pancakes are some of the best I’ve ever tasted, even when compared to traditional versions! They have an amazingly fluffy texture and an addictive flavor, using just 5 main ingredients. Is Almond Flour better than Regular Flour? I’m often asked which flour is the “best” option, but the answer will vary depending on your dietary needs. I do prefer using almond flour over regular all-purpose flour, because almond flour is minimally processed (it’s just ground blanched almonds! ), low in carbohydrates, and high in fiber and healthy fats. The only downside to almond flour is that it’s high in calories and can be easy to over-consume. 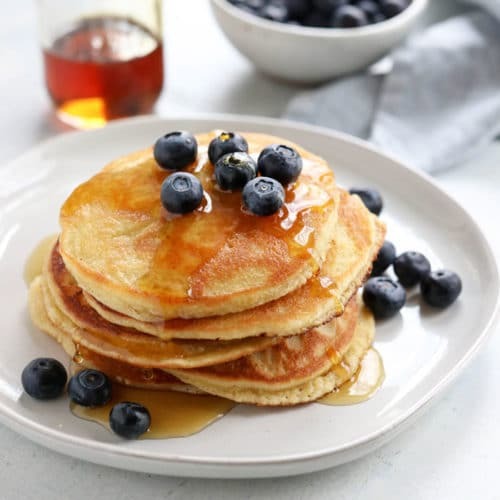 So, keep in mind that these almond flour pancakes are very filling! Since I’m always asked about substitutions in the comment section, I want to address this right away. If you have a nut allergy or would rather use what you have on hand in your pantry, I’ve heard that you can swap all-purpose flour for almond flour using a 1:1 ratio. I have not tested that on this particular recipe, so please leave a comment below letting me know if you try it! Do you have a favorite pancake recipe? Feel free to share it in the comments below! Stir together all of the ingredients, keeping in mind that the batter won’t be quite as runny as traditional pancake batter. When the batter is too wet, they are difficult to flip, so I don’t add any extra water to thin out the mixture. Just like traditional pancakes, you’ll cook these for about 3 to 4 minutes on one side, until the batter bubbles a bit on top, and then you’ll flip them over and cook for another 2-3 minutes. Keep the cooked ones warm in the oven if you can’t serve them right away, then top them with fresh fruit or any of your other favorite pancake toppings. Extra pancake syrup isn’t really necessary with these, but you can add it if you want to! 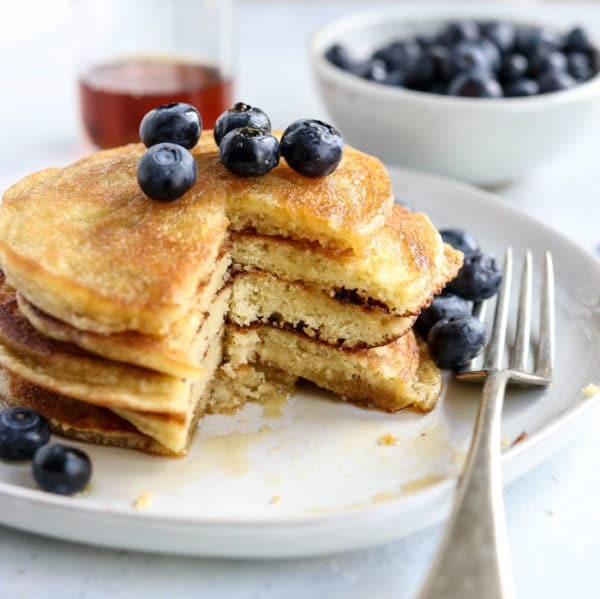 These Almond Flour Pancakes are my favorite gluten-free recipe! They are low-carb, keto-friendly, and easy to make with just 5 main ingredients. Preheat a skillet over medium-low heat on the stove. As it heats, stir together the almond flour, eggs, maple syrup (if using), olive oil, baking powder, vanilla, and salt in a large bowl. The batter will be a little thicker than traditional pancake batter. Grease the preheated skillet with butter or olive oil, then pour 3 to 4 tablespoons of the batter into the center of the skillet (I use a scant 1/4 cup). Use a spatula to spread the batter out into a round pancake shape, about 1/4 to 1/2-inch thick. 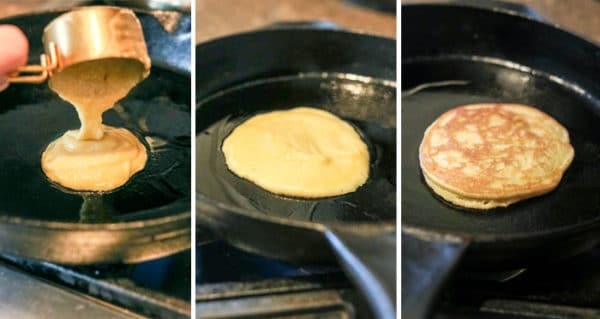 Cook until little bubbles start to form around the edges of the pancake, and as soon as the bottom feels sturdy enough to flip (about 3 to 4 minutes of cooking time), use a spatula to flip the pancake and cook the other side, about 2 to 3 more minutes. Repeat with the remaining batter, until all of the pancakes are cooked. I usually get about 6 pancakes from this batch that are roughly 4 to 6 inches in diameter. Even though they are on the smaller side, they are very filling! Serve warm with your favorite toppings. Prepare the batter as directed above, but instead of using the stove preheat the oven to 350ºF and line a large baking sheet with parchment paper. 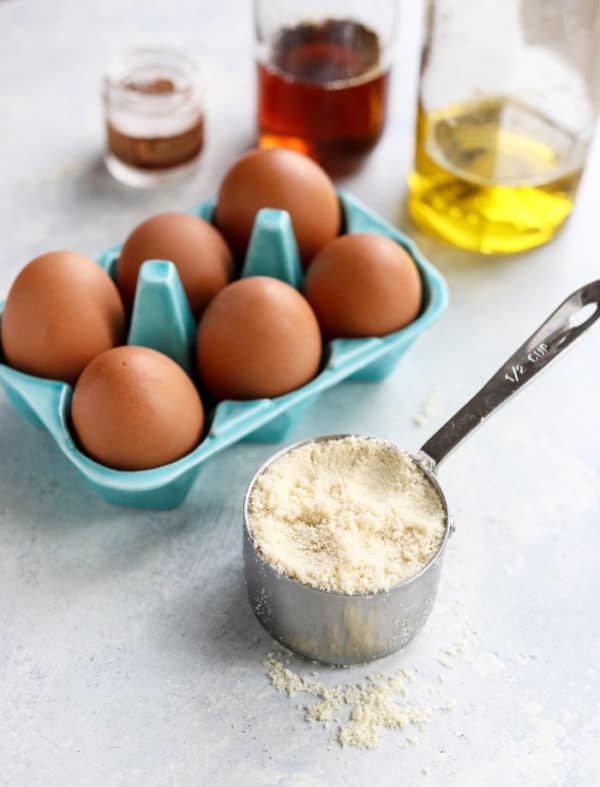 Pour the prepared batter by a scant 1/4 cup onto the lined baking sheet, and use a spoon or spatula to spread the batter into a round pancake shape until it's 1/4-inch thick. Leave about 1-inch between each pancake, and repeat with the remaining batter until you have roughly 6 pancakes on the pan. Bake at 350ºF for 10 minutes. The pancakes should puff up, and you don't need to flip them, as long as they look like they are thoroughly cooked through. I like to flip them over for serving, so the browned side is on top. Serve warm, with your favorite pancake toppings. I have not had success making egg-free almond flour pancakes yet. I’ve tried replacing the egg with both a banana and arrowroot starch, and neither works very well. (I definitely wouldn’t serve them to company.) I’ll keep you updated as I test more vegan versions, though! Be sure to check out the other pancake recipes I linked to above in this post, for more vegan pancake options. Do not use other flours in this recipe. Instead, check out the other pancake recipes I posted earlier in this post for substitution ideas. Reader Feedback: Do you have a favorite pancake recipe? Please feel free to share more ideas in the comments below! Amazing! I love how they fluff up when then cook! Just tried the recipe and these almond flour pancakes are perfect. Next time I’ll double the recipe to make more. Oh my gosh, these are the BEST pancakes! 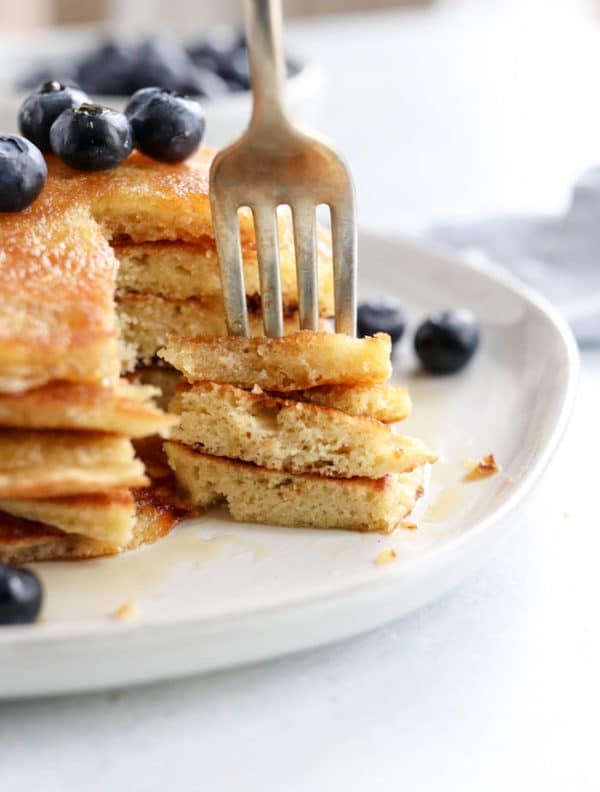 I didn’t think an almond flour pancake could possibly be as good as the buttermilk ones my mom used to make, but these totally satisfy my craving while letting me stick to my paleo diet. Thank you! Has anyone successfully made these with flax eggs? Amazing pancakes! I LOVE almond flour baked goods, they are so filling so I don’t need many, so satisfying and they don’t give me any symptoms like gluten filled recipes do. Megan does a great job with these recipes. I made these in my vitamix because my almond flour wasn’t very smooth, so they were pourable and turned out really fluffy. I almost wonder if you could turn this into a cupcake. I used XL eggs and my second time cut the maple syrup out and they were great. Great job on another excellent recipe! Delicious!!! Definitely it just make a small batch of pancakes. But they are delicious. But keep that in mind if you have a hungry husband, lol. Its a very thick batter and its not easy to spread in the pan. But definitely this recipe is a keeper. Finally a good pancake recipe with just almond flour! Juts a quick question. Have you tried this with almond meal? So I wasn’t going to make these because this recipe is so similar to another recipe that I already make. But I am so glad I did! The baking powder makes all the difference. They puffed up way more than traditional almond flour pancakes. I would definely recommend this recipe. They keep you full for hours and do not taste gluten free. Thank you so much, Megan! Wow, these turned out so well! I baked them so I didn’t have to add the extra oil in the skillet. I never leave comments, but I had to let you know that these are the BEST pancakes I’ve ever tasted. My new go-to recipe! I absolutely love this website! I make several recipes every week as go to meals. I just made these pancakes and I’m not sure why they came out so bad. I did the maple free version so I used water and for the oil I used avocado like I do in every recipe and they were soooo salty. I def only did the 1/4 tea but I couldn’t even finish the one I tried. I also baked them just for more reference. I’m still going to check back for new recipes all the time but I think I’m gonna stick to the almond butter pancakes recipe that I’ve used for years from this site. Side note I make them with cashew butter and they are even better! Avocado oil is what I mean not actual avocado! Aw, sorry to hear that! I should have mentioned that if you leave out the maple syrup I would leave out most of the salt. They need each other for balance, so if you leave one out, the other is too strong. I’ll adjust that in my notes. 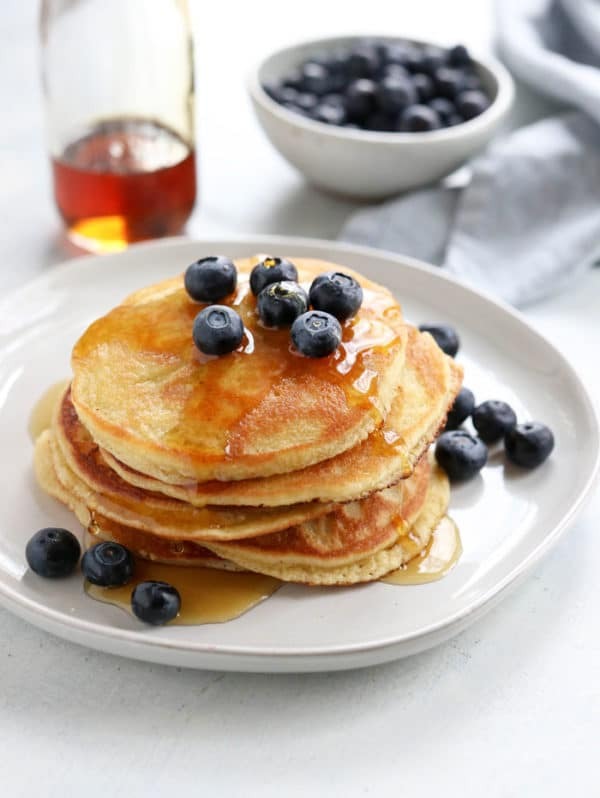 The almond butter pancakes are still one of our favorites, too! These were amazing!! I was so happy to happen upon this recipe when I woke up this morning. My daughter and I are not eating grain or dairy, so this definitely filled a craving for bread. We had some for breakfast and some with butter for dinner! Yum! I love your website and first book and have followed you for a few years! You definitely make healthy eating attainable and yummy. I have told many people about your website over the years! So thank you for all your great recipes, beautiful pictures, and nutrition advice.